The disease typically affects the renal and extracranial carotid arteries, but it has also been noted in most medium-sized arteries throughout the body, most commonly the mesenteric, external iliac, and brachial arteries. Disease manifestations depend on the arterial bed involved: most often, the extracranial carotid or vertebral arteries are associated with headache (generally migraine-type), pulsatile tinnitus, neck pain, or dizziness, whereas the renal arteries are often associated with hypertension. More severe symptoms such as transient ischemic attack (TIA), stroke, ruptured aneurysm, or a carotid or vertebral artery dissection can develop in patients with cerebrovascular FMD. [1, 3] The diagnosis of FMD is made by imaging studies; there is no blood test for FMD. and biopsies are not performed. 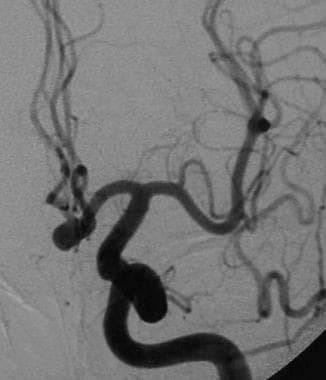 Angiogram of type 1 fibromuscular dysplasia in a 43-year-old female patient with multiple transient ischemic attacks. Note the multiple saccular dilatations of the internal carotid artery between the first and second cervical vertebrae. Although conventional computed tomography (CT) scanning has no role in the diagnosis of fibromuscular dysplasia, it is essential for assessing the intracranial consequences of the disease. CT angiography (CTA) may be used as a noninvasive means of diagnosing the vascular changes of FMD. CTA may display the pathognomonic string of beads appearance of the internal carotid artery. It is recommended that CTA findings be confirmed with carotid angiography. Current resolution (voxel sizes) of CT may limit the usefulness of this modality in the diagnosis of subtle cases. As this technique improves, its negative predictive value may increase, so as to make it useful in excluding FMD from the differential diagnosis. Signal/noise artifacts or reconstruction artifacts that occur with CTA occasionally may mimic the contour irregularity of FMD. Like CTA, MRA may be used as a noninvasive means of diagnosing the vascular changes associated with FMD. Although MRA does not require the use of contrast, intravenous administration of a gadolinium contrast agent often yields superior imaging results. Confirmation of the findings through the use of carotid angiography is recommended before endovascular or surgical interventions are considered. Gadolinium-based contrast agents have been linked to the development of nephrogenic systemic fibrosis (NSF) or nephrogenic fibrosing dermopathy (NFD). For more information, see Nephrogenic Systemic Fibrosis. NSF/NFD has occurred in patients with moderate to end-stage renal disease after being given a gadolinium-based contrast agent to enhance MRI or MRA scans. NSF/NFD is a debilitating and sometimes fatal disease. Characteristics include red or dark patches on the skin; burning, itching, swelling, hardening, and tightening of the skin; yellow spots on the whites of the eyes; joint stiffness with trouble moving or straightening the arms, hands, legs, or feet; pain deep in the hip bones or ribs; and muscle weakness. For more information, see Medscape. Current resolution (voxel sizes) of MRA may limit the usefulness of this modality in the diagnosis of subtle cases. MRI is sensitive to motion and metallic artifacts. MRI images may appear artifactually beaded as a result of the patient's swallowing during the examination. The presence of a ferrous metal object may cause the contour of the vessels to be distorted. Signal/noise artifacts or reconstruction artifacts that occur with CTA or MRA occasionally may mimic the contour irregularity of FMD. Given that the pathology of FMD involves the distal cervical segment of the extracranial internal carotid and vertebral arteries, carotid ultrasonography may provide suboptimal views and potentially may not be able to visualize the areas of involvement. Angiography is the criterion standard for diagnosing fibromuscular dysplasia. The string of beads appearance is considered pathognomonic for medial fibroplasia on diagnostic angiography. The classic string of beads contour is characterized by a long-segment tubular stenosis or ovoid-shaped outpouchings. When the carotid arteries are involved, the cervical segment C1-C2 is most often affected. Intracranial disease is rare; when it does occur, the beaded appearance may extend to the supraclinoid segment of the internal carotid artery or to the middle cerebral artery. A diagnosis of intracranial FMD should not be considered in the absence of cervical carotid disease. Subtracted digital angiogram demonstrating multiple saccular dilations and stenosing webs. Increased turbulence and foci of stasis predispose the patient to thrombus formation. 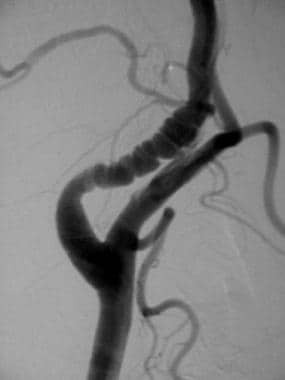 Anterior communicating artery aneurysm. An increased association of aneurysm formation is seen in patients with fibromuscular dysplasia. 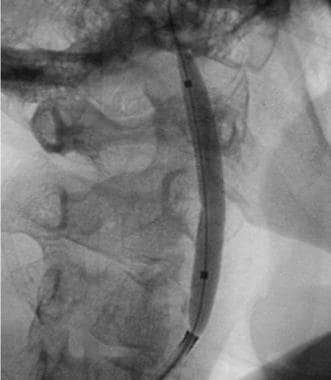 Balloon angioplasty offers a minimally invasive means to improve the arterial flow dynamics in fibromuscular dysplasia. 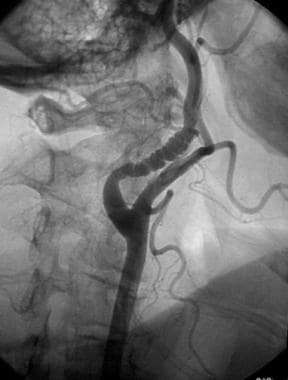 Postangioplasty angiogram demonstrating improved luminal diameter of the internal carotid artery. Stenting may provide a more normal luminal contour, further decreasing thrombogenicity. Patients with carotid FMD may also have renal artery FMD and, less commonly, FMD of the lumbar, mesenteric, celiac, hepatic, and iliac arteries. Therefore, peripheral angiography should be considered for those patients manifesting symptoms of arterial stenosis or thromboembolic disease. Conversely, if fibromuscular dysplasia is encountered anywhere in the peripheral circulation, the carotid arteries should be evaluated. Kadian-Dodov D, Gornik HL, Gu X, Froehlich J, Bacharach JM, Chi YW, et al. Dissection and Aneurysm in Patients With Fibromuscular Dysplasia: Findings From the U.S. Registry for FMD. J Am Coll Cardiol. 2016 Jul 12. 68 (2):176-85. [Medline]. [Full Text]. Brinza EK, Gornik HL. Fibromuscular dysplasia: Advances in understanding and management. Cleve Clin J Med. 2016 Nov. 83 (11 Suppl 2):S45-S51. [Medline]. [Full Text]. Khoury MH, Gornik HL. Fibromuscular dysplasia (FMD). Vasc Med. 2017 Jun. 22 (3):248-252. [Medline]. [Full Text]. Bagh I, Olin JW, Froehlich JB, Kline-Rogers E, Gray B, Kim ESH, et al. Association of Multifocal Fibromuscular Dysplasia in Elderly Patients With a More Benign Clinical Phenotype: Data From the US Registry for Fibromuscular Dysplasia. JAMA Cardiol. 2018 Aug 1. 3 (8):756-760. [Medline]. O'Connor S, Gornik HL, Froehlich JB, Gu X, Gray BH, Mace PD, et al. Smoking and Adverse Outcomes in Fibromuscular Dysplasia: U.S. Registry Report. J Am Coll Cardiol. 2016 Apr 12. 67 (14):1750-1. [Medline]. [Full Text]. Olin JW, Gornik HL, Bacharach JM, et al. Fibromuscular dysplasia: state of the science and critical unanswered questions: a scientific statement from the American Heart Association. Circulation. 2014 Mar 4. 129 (9):1048-78. [Medline]. [Full Text]. Varennes L, Tahon F, Kastler A, Grand S, Thony F, Baguet JP, et al. Fibromuscular dysplasia: what the radiologist should know: a pictorial review. Insights Imaging. 2015 Jun. 6 (3):295-307. [Medline]. Malagò R, D'Onofrio M, Mucelli RP. Fibromuscular dysplasia: noninvasive evaluation of unusual case of renal and mesenteric involvement. Urology. 2008 Apr. 71(4):755.e13-5. [Medline]. Haussen DC, Grossberg JA, Bouslama M, Pradilla G, Belagaje S, Bianchi N, et al. 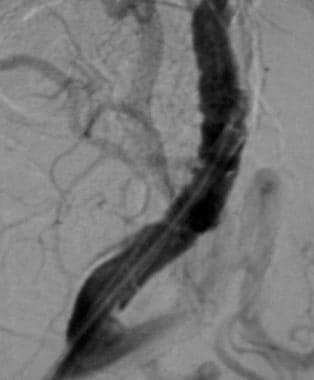 Carotid Web (Intimal Fibromuscular Dysplasia) Has High Stroke Recurrence Risk and Is Amenable to Stenting. Stroke. 2017 Nov. 48 (11):3134-3137. [Medline]. [Full Text]. Diagram representing the 3 major characteristic angiographic patterns seen in fibromuscular dysplasia of the internal carotid artery. Courtesy of Neuroradiology Test and Syllabus, Part 2. My sincere thanks to Ms Nancy Washburne, Radiology Librarian, for her cheerful diligence in collecting the data for this article.